Prince Rupert firefighters battle a fire in an apartment building on 2nd Avenue West on Tuesday evening. A fire in an apartment building on 2nd Avenue West began at approximately 6 p.m. when several onlookers downtown first noticed the smoke. The Prince Rupert Fire Department responded with 13 firefighters and four fire apparatus and emergency vehicles. 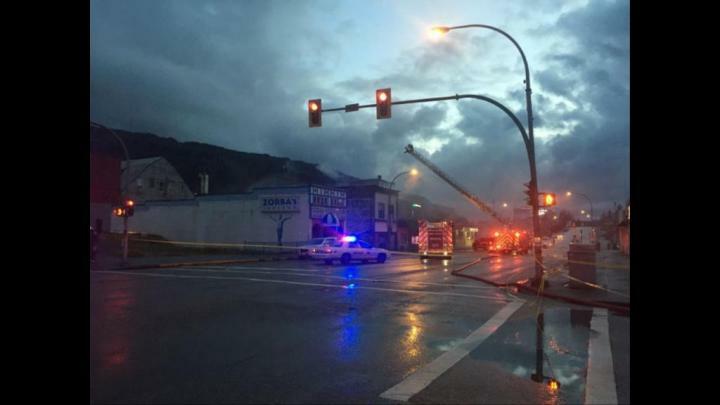 “The fire was contained to one apartment but there was smoke damage to the upper floor,” said Prince Rupert Fire Chief Dave Mckenzie. There were no injuries and all the tenants were able to get out of the building. Mckenzie said Emergency Social Services was called and they found housing and clothing for at least 10 people who were put out by the fire. They will be subsidized for up to 72 hours. The fire was between 6th and 7th Street by Zorbas Taverna and McElhanney Consulting Services Ltd. There was minimal water damage to the McElhanney building, Mckenzie said. Witnesses watched the firefighters from all angles as they tried to put the fire out Tuesday night. The RCMP and the fire department spent the night monitoring the site and they will remain on the scene throughout Wednesday, Oct. 19 to continue their investigation on what caused the fire.